When the home inspector walked into the Concord backyard, he couldn’t believe his eyes – the steps leading up to the backyard composite deck were totally disintegrated. 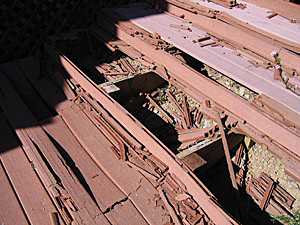 Early composite decking made its debut in the 1990s. The original composite decking was made from a combination of recycled plastic milk jugs and old shipping pallets. It was an environmental solution to using wood in deck construction, but the sun’s UV rays proved to be a formidable opponent. A decade later, manufacturers figured out the ‘recipe’ for new composite products that looked like fresh cut Cedar or Brazilian Walnut, but never turned grey… and that’s when composite decking sales took off.